West system thickened epoxy. I prepped the blank by cleaning the glued area with alcohol, then lightly sanded to roughen up the area. Tape area off so you don't get glue all over the blank. The two pieces want to separate because you compress air when you put them together with the glue. Just work at it and it will seat. I then lightly clamped the two pieces together on my bench with a piece of wax paper under the glue area. I get mine from him too. I really like the hooks and the ability to use clips on 1/2oz jigs. I have a 2 piece gsb 1321m that is custom and I think it's fine. I glued it together so now its one piece. You're not going to find a higher end rod new for that price. I built a rod geeks 11'er with them last year. So far, no issues. 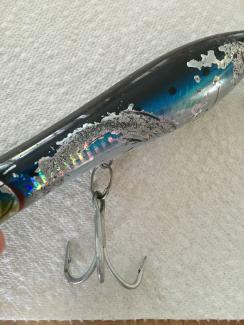 What are your top 5 surf fishing lures? if you look to the left, the split ring didn't fare to well either. What are using for pliers/braid cutters? me too. unfortunately I have no time or desire to care for them other than a quick rinse. I haven't kept a bass in years. I'm partial to clams myself. I keep one like that in the car and a Sargent on my waist. It's tough to put a split ring worth it's salt on the belly. I tend to use the tsunami a bit more. you're not going to carry that thing on your belt...are you? My Sargents have one arm that rusts big time. You get these or manleys because you know you will cut a hook out of something. For cutting braid, the $3 rapala scissors that seem to be at every checkout counter do that.